Diving into a warm, steamy bowl of this delicious low-calorie crumble will actually be doing your body a favor! The blueberries and raspberries are loaded with vitamin C and the blueberries offer phytochemicals, which may have a very positive effect on your health. The whole grain oats offer loads of fiber and have been shown to lower both total and LDL cholesterol. Add to that a little dose of chopped walnuts rich in phytochemicals and healthy fats and you have yourself a healthy dessert. Sure, a bit of sugar is added for a little extra sweetness, but just watch your portion size and enjoy without too much guilt. Preheat the oven to 375 F so that once the berry crumble is assembled, the oven will be hot and ready. Spray an 8-inch shallow round baking pan with non-stick cooking spray. Keep in mind that if you are using frozen berries, you will want to thaw them before beginning. You can do this either by placing them in the refrigerator for a couple of hours before beginning or by rinsing them in cool water in a large colander. Either way, eliminate any excess water by patting dry with paper towels. In a medium-sized mixing bowl, combine the berries. Sprinkle the granulated sugar over and drizzle the orange juice concentrate over the berries. Mix the sugar and concentrate into the berries until all the ingredients are evenly combined. Pour the berries into the prepared pan. To prepare the topping, pour the oats into a medium sized mixing bowl. Add the packed brown sugar, and then sprinkle the ground cinnamon and the salt into the oat mixture. Using a fork, combine the ingredients and be sure they are evenly tossed together. Now sprinkle the oat mixture evenly over the berry mixture, making sure to cover the edges and corners. Place the berry crumble in the oven and bake for 25 minutes, until the berry mixture starts to bubble up along the sides of the dessert. Remove and allow to cool for 10 minutes. This dish is best served soon after it is baked while it is nice and warm. Enjoy it with a small scoop of vanilla frozen yogurt or low-fat ice cream. You could use small sized individual ramekins if desired; they do make very nice individual desserts for entertaining. Simply divide the berry mixture and the topping evenly among 4 ramekins. 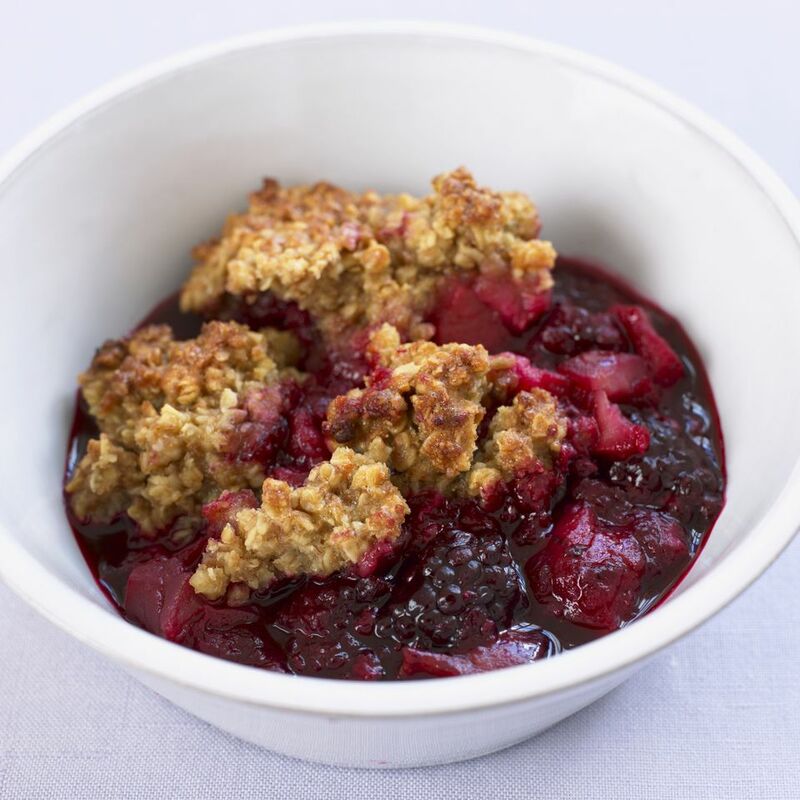 Bake the berry crumble as instructed in the original recipe. Because individual ramekins will cook quicker, begin checking the crumble for doneness after about 15 minutes of baking time. The smaller berry crumbles should be completely cooked through by about 20 minutes.